Wow at Woolshed. Extraordinary. So that's over 1300mm the past week . Transmitters serving the area of Condon and Kirwan, west of Townsville, are REQUESTED TO USE THE STANDARD EMERGENCY WARNING SIGNAL BEFORE BROADCASTING THIS MESSAGE. For people in Gulf Country, Northern Goldfields and Upper Flinders, Herbert and Lower Burdekin, North West and parts of Peninsula and North Tropical Coast and Tablelands Forecast Districts. Issued at 7:34 am Saturday, 2 February 2019. Extremely heavy rainfall and significant flash flooding are occurring west of Townsville. Heavy rainfall and flash flooding remains a high risk about parts of northern Queensland. Damaging winds possible in the northwest. Weather Situation: The monsoon trough extends from the the north tropical coast in the Ingham area westward to a tropical low over the northern North West district. Heavy rainfall is likely within the warning area during today. Six-hourly rainfall totals between 150mm to 200mm are likely with isolated heavier falls possible, particularly with bands of thunderstorms. Creek and river catchments are already saturated and will therefore respond very rapidly to any rainfall. Flash flooding is a high risk. Landslides have been reported associated with this event and will continue to be possible in vulnerable areas that have experienced significant rainfall. The monsoon trough is expected to remain active into next week, with further heavy rainfall expected for already saturated catchments between about Innisfail and Bowen. The potential for significant and dangerous flash flooding will likely continue into next week. Locations which may be affected include Lucinda, Ingham, Palm Island, Rollingstone, Townsville, Giru, Ayr and Bowen. 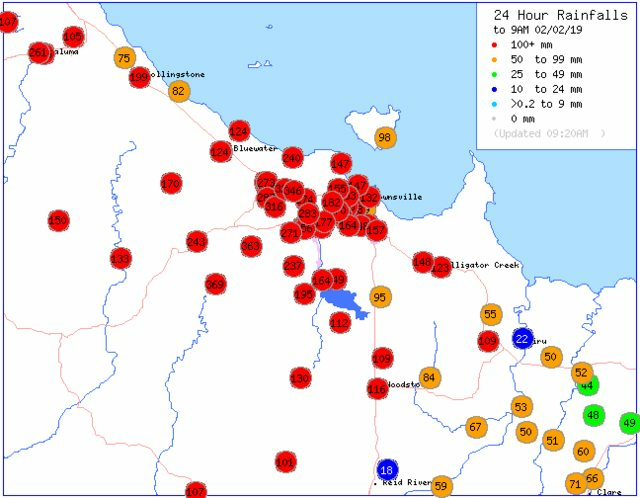 The heaviest rain is currently falling in the Townsville area with Mt Margaret recording 184mm in 3 hours and 225mm in 6 hours to 6:45am. Heavy rainfall, which may lead to localised flash flooding, is expected over parts of the Gulf Country, North West and Northern Goldfields and Upper Flinders districts during Saturday. Six-hourly rainfall totals of 75 to 125mm are possible, with locally higher totals with bands of thunderstorms. Isolated damaging wind gusts are also possible with thunderstorms. Locations which may be affected include Charters Towers, Georgetown, Croydon, Camooweal, Mount Isa, Cloncurry, Julia Creek, Richmond, Urandangi, and Kowanyama. Cloncurry 156mm, including 110mm in 6 hours to 2am. The next Severe Weather Warning will be issued by 10:45 am AEST Saturday. It is pouring rain in Kirwan and not letting up. Bucketing down in Mundingburra near aplins weir, amazing totals Alice River area. PRIORITY: The Bureau and Emergency Services would appreciate this message being broadcast regularly. Major flood levels are expected in the Bohle River at Mt Bohle during Saturday morning. Major flood levels are possible in the Ross River at Aplin Weir over the weekend with forecast heavy rainfall. It is really important that residents listen to emergency services or Council employees during this flood event. The increase in flow from Ross River Dam may result in flooding of properties and the public are advised to move personal items to a higher level. Authorities will further open the Ross River Dam spillway gates to try and prevent more significant flooding for downstream suburbs if this major rain event continues. The spillway gates will be opened to a higher level, allowing more water to flow out now in order to reduce the potential for significant downstream flooding given the forecast for heavy rain to continue for the next few days. Ross River Dam continues to spill. River levels at Black Weir are steady and currently below the minor flood level. The Ross River at Aplin Weir is currently at 2.21 metres and rising. Further rises are expected and the river level at Aplin Weir may reach the major flood level (2.90 m) during the weekend. This prediction is based on forecast rainfall. Major flood levels are rising at Little Bohle RIver. Renewed rises are expected further downstream. No observations are currently available for the Bohle River at Mt Bohle. Based on upstream river levels, the Bohle River at Mt Bohle is expected to now be below the major flood level of 7.0 metres. The Bohle River at Mt Bohle is likely to exceed the major flood level (7.00 m) during Saturday morning. Stream levels along the Black River and Bluewater Creek are currently steady and remain below the minor flood level. Fast renewed rises are expected if heavy rainfall moves back into the catchment areas. The next warning will be issued by 11:00 am EST on Saturday 02 February 2019. 139mm to 9am in BG. Already beaten the total at my home in Rasmussen for last year by 166mm. Speaking my old man last night, he can’t remember Townsville having a bigger rain event than this. There probably has been but he reckons not even as a kid growing up in Gulliver. He can’t recall it. The numbers are just staggering. Stay safe everyone. Burdekin bridge at Selheim is now closed. Just spent 3 hours helping fill and load sand bags at Dalrymple depot, lots of people out helping pretty much drive through service for sand bags. Shame the council couldn’t bring down some water for those helping, I ended up going to coles and they gave me 48 bottles half price, lots of people getting bags too where bring water or coffee. Everyone pitching in made it light work(we’ll relativly) lol. Just a reminder If you do need bags, they are bloody heavy, some people wanted far too many than the cars could carry safely, lots of suspension very strained. Well done exodus, I'm sure a lot of people would appreciate your efforts! Bucketing down in Nelly Bay. Stay safe everyone in Townsville and surrounds. Our Ross River Dam is at 213% (catchment area 750 km²). Pouring again in BG. Just a phenomenal, once in a lifetime event! !